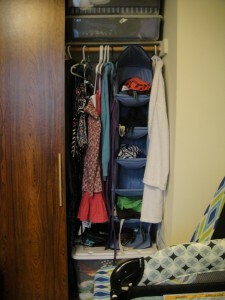 It has been almost two months since I chose my 33-item wardrobe, and so far the project has been a definite success! I spent a month visiting my parents, and having brought most of my 33 items with me, I was surprised to realize at the end of my trip that one summer dress didn’t get worn at all! I did wear it the first week back though – it is better suited to muggy Toronto summer weather than milder Victoria days. It’s not too tidy, but I can still see all my options and pull clothes out without hangars falling or shelves collapsing, and that’s a win for me! I was very happy when Matt announced that he had gone through his side of the closet and pulled out a few shirts and pants that he never wears. I can’t say whether it’s directly related to my own closet purge, but it is very nice to have our clothes comfortably fit in our shared closet. I am definitely thinking of sticking with a limited wardrobe when these three months are up, and I think it will be much easier to purge my unworn summer clothes (many of which are hangers-on from as far back as high school) now that they have sat unmissed in our storage closet. Not only do I feel good for making do with my existing wardrobe, I am looking forward to end-of-season clearance sales because I’ll know specifically what I need for next year. I can plan a budget and shop guilt-free by sticking to those needs (most of my tank tops and two of my t-shirts are showing signs of wear) and not get sidetracked by pretty shoes that will hurt my feet or sundresses I simply don’t need.